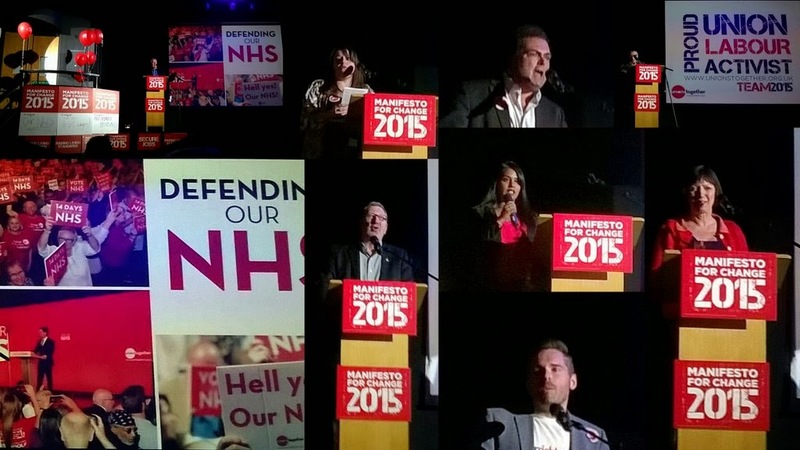 This collage is from the "Unions together" TULO Rally in London on Monday. Last week Ed Miliband and UNISON General Secretary, Dave Prentis, spoke at the national TULO rally in Birmingham with over 1000 union members present. General secretary of the GMB, Paul Kenny, was the first main speaker and he compared the huge number of people who are now forced to beg for insecure jobs on poverty wages with what happened in the London Docks in the 19th century. He pointed out that the Sunday Times Rich list reported that the personal wealth of the richest had doubled since 2010 while working people have had their income slashed. He condemned UKIP for attacking the exploited and not the exploiters. Next was Jack Elliot, a GMB member and grass roots Labour Party activist, who first voted in 1945. He attacked the ultra left Party TUSC for betraying workers, working with racists and doing what they can to let the Tories win. To loud cheers, he told us that "he had a go" at the Trotskyist newspaper sellers outside as he came in. He called for a real unity of all things and vote Labour. UNISON Branch secretary Emine Ibrahim spoke passionately about the 18% cut in wages in real terms for Council staff since 2010. How her members cannot pay their bills and rely on loan sharks to survive until pay day. She called on all of us to work in the marginal seats to bring about a Labour victory. Unite General Secretary, Len McCluskey, urged all union members to vote Labour and get rid of the Tories. The Tories are the party of fear while Labour is the party of hope. Reject the Tory path to food bank and rip off Britain. Make sure the super rich and corporate elite pay their bloody taxes! Ed Miliband and Labour put hope back into politics. Vote for Change. Vote Labour and kick the Tories out and build a better Britain. London Assembly member, Tom Copley, described his job has trying to keep his eye on Boris as London Mayor. A difficult job since Boris he is rarely at his post as Mayor. Tom urged union members to remember the 11 million people who rent their homes from private landlords and how important it is for them to have a Labour government, who will cap rent rises and introduce 3 year tenancies. Manuel Cortes, from the railway union TSSA believes that Labour leader Ed Miliband will rebalance our society and economy away from the interests of the top 1,000, who have increased their wealth by £250 billion since 2010. He is really pleased that Labour have promised an industrial policy if they win power. He reminded us that Ed has said that it is not leaders that change the world but movements. TUC General Secretary, Frances O'Grady, began by stating that she was proud to be the daughter of immigrants and proud of the role that people like her mother made to the NHS as a nurse. She looked forward to a Labour government introducing worker reps on company remuneration committees to stop greed at the top. She thought the Tories claim to be "the workers party" as convincing as Cameron's claim to support West Ham FC. Last speaker was Uma Kumaran, the Labour candidate for Harrow East in London. When she speaks to people and says she is a trade unionist, some say she doesn't look like one. She replies that it does not matter what you look like to be a trade unionist but do you believe in common decency for all and standing together in order to achieve it.